“This day just keeps getting better.” Deputy Dorie Berenger stared at the alligator in front of her. It had to be the swimming pool. Why anyone below sea level and not even a mile from the Gulf of Mexico would install an in-ground pool was beyond her. Even the houses in Gator Bait, Louisiana, sat on fifteen-foot stilts. An in-ground pool was just asking for trouble. And trouble was just what they had. Maylene Thibodeaux bulged out of a lawn chair next to her pool’s cloudy water, jug in hand. She wore a pink bikini and was sitting in stoned silence. Which was rare when you considered her usual mouthiness, but understandable since it was almost evening and she had probably been at happy hour since before noon. Dorie stepped right up to the pool’s edge and studied the alligator more closely. He was a good-sized one, probably ten or twelve feet and currently floating like the dead in the center of the pool, with what looked like a backpack hanging out of his mouth. His eyes were half-closed, as if he would drop off into sleep at any moment. “What do you think?” asked Deputy Joe Miller. Joe had been the first to arrive at Maylene’s, but had immediately called for backup. This one was definitely out of his league. It figured. 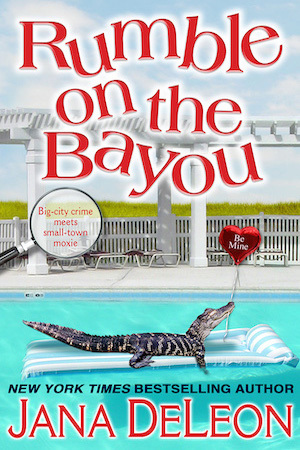 Maylene Thibodeaux was hard enough to please sober. Drunk was a whole different story. “You didn’t let her give you any, did you? That stuff’s worse than drugs.” And it seemed to produce the same kind of hallucinations. In the past, they’d been called out for everything from aliens in her garden to unicorns in the bedroom. Dorie had been slightly surprised to learn the gator was real. Dorie smiled. Joe was probably right. Maylene Thibodeaux had been making her own stash since she was a little girl. Rumor had it Mr. Thibodeaux had behaved oddly and had a strange tone to his skin on the day of their wedding thirty-five years ago. Folks around town said his skin was the same exact color when they buried him six months ago, making Maylene the most patient hunter in the parish. It had taken her only minutes to trap her prey, but thirty-five years to kill it. Maylene’s ears must have been burning because suddenly she came alive and rose from her chair. Actually, the chair rose a bit with her, and there were a couple of seconds of detachment necessary. Then she glared at Dorie. Dorie squatted for a moment and assessed the situation. At five-foot-ten, she towered over most of the women in Gator Bait and a whole heck of a lot of the men. Sometimes getting an eye-level look at things was the first order of business. She noticed, however, that all six-foot-four of Joe didn’t feel compelled to hunch down on the cement with her, but then, standing at the edge of the pool was probably much closer than he ever wanted to be. “You poked him with the cleaning brush, huh?” she asked Joe as she rose. He nodded. “Not a peep. If I didn’t know any better, I’d swear he was drunk.” They both looked at Maylene. “Maylene, you didn’t put any of your special brand in the pool, did you?” Dorie asked. Dorie glanced over at Joe, who tried not to smile, then grabbed the pool-cleaning brush and pushed on the gator’s side. His body moved a couple of inches across the water, but only because she was pushing, not because he was helping. She shoved again. Still nothing. He seemed perfectly content to be propelled through the pool. She continued to push the gator until he was next to the far wall, then crept around the pool, first tapping his tail with the brush and slowly working her way up to his head. When she got to the front, she poked him square in the nose. He didn’t even flinch. Dorie leaned the brush against a patio table and grabbed the long blond ponytail hanging halfway down her back. Twisting it in a knot, she secured it at the nape of her neck with a pen and rolled her sleeves up over her shoulders. Her usual “uniform” of jeans and a T-shirt would be able to withstand a splash of Maylene’s pool water, but she didn’t even want to consider what it would take to wash the slimy substance out of her hair. “I hope he ain’t got whoever was wearing it locked in his belly,” Joe said. The chair popped off Maylene’s rear as she hurried between the stair railings and up to the house. She was back a minute later, camera in hand. “Okay. Do your stuff,” she said, looking excited for the first time since Dorie had arrived. “Be careful, Dorie,” Joe said from the other side of the pool. She noticed he didn’t offer to come any closer. Knowing it was now or never, she made the sign of the cross and picked up the cleaning brush again. She gently inserted the pole into the gator’s mouth right beside the backpack, then pushed down on the pole, prying his mouth open. To her utter amazement, it worked, and the lethargic animal still hadn’t twitched. Reaching down slowly, she carefully lifted the backpack from between the razor-sharp teeth, Maylene clicking furiously on her camera the entire time. Dorie rose swiftly with her prize and received cheers from Joe and Maylene. She looked back at the gator. He still rested peacefully, his mouth propped open with the cleaning brush. She bent down and studied him again just to make sure she hadn’t missed anything. Dorie nodded in agreement, then caught sight of something at the tip of the gator’s mouth. It was small and cylindrical. About three inches long. “You got any salad tongs?” she asked Maylene. Maylene glared for a moment, then started toward the house again, stomping as she went. Maylene returned shortly with the salad tongs. She handed them to Dorie who squatted back down next to the Bator and gently put the tongs into his mouth, clamping down on the object and pulling it out. Taking a brief look, she smiled. Joe had finally gotten up a little nerve and crossed to her side of the pool, although he still stood several feet away. Dorie tossed the object at him. Reflex made him catch it, but when he looked down and saw what he held, he immediately dropped it.